Have a light or laser attachment? Check out our Light bearing RMR cut Mounted Holster! I SEARCHED FOR ABOUT A MONTH, BEFORE I FOUND DARA HOLSTERS. I SPENT COUNTLESS HOURS ON Utube researching. I was about to purchase a holster out of state. Then I thought why not find a local holster company in North Carolina. Then I come across Dara Holster Company. They had some really nice rigs! I have never purchased a holster before. One thing I knew I wanted great quality product that would last for ever. I ordered my custom kydex holster and was absolutely blown away! It's simply a amazing holster the thicker kydex is perfect. Don't waste your time order from Dara Holster Company! So many options, with colors and cant adjustment and several different paddles basically everything you can imagine. It was a little longer wait as there busy and your so anxious to get your holster. This company offered what I was looking for and the holster for my S&W 45 was easy to mount. Its tucked perfectly where I can get to it if I ever need it. Their photographs match their product. Thanks Dara Holsters! It is the best holster in the world! I was researching online and finally after 1 month I found my product. Also, it has a lifetime warranty. Simply the best. Money well spent. I appendix carry my G19 and grew tired of being uncomfortable while in the drivers seat. I have tried a different mount that secures to the kick panel under the steering wheel using two straps with hooks. It served its purpose but to me it was more of a pain in the buns than it was worth. 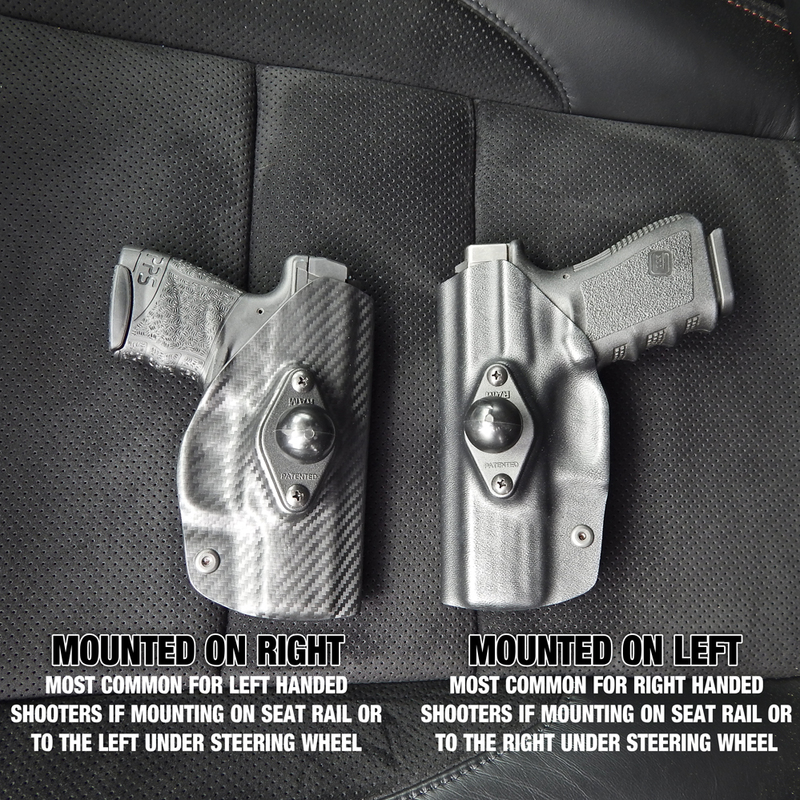 I started looking at other options online and found Dara Holsters Ram Mount. I figured I couldn't go wrong with the Ram setup. I have used them on my boats for years with heavy electronics on heavy water and for the most part have held up well. I was also drawn to the Dara Holster because it completely covers the trigger. I'm not about to have and exposed trigger rolling down the highway. The holster showed up right in the lead time window the stated prior to being purchased. Installing was simple. Position the holster where you want it, drill a few holes, mount the Ram Ball, and attach the holster at the desired angle. The weapon hasn't moved while driving. It is secure and easily accessible. They come molded for suppressor sights and cut for an RMR. This holster is everything that I was looking for. Too bad they didnt send a decal for my gun safe door!! easy to mount solid product.